Thank you, my friends, for all of your kind and sympathetic words. They've meant a great deal to me over these recent days. FYI, my most recent "Looking Back on Genre History" segment is up on Episode 410 of StarShipSofa. It's the first of a two-part look into the science fictional and historical inspirations behind the Jedi of Star Wars. If you listen, I hope you enjoy! And now, a moment of joy, courtesy of my niece. 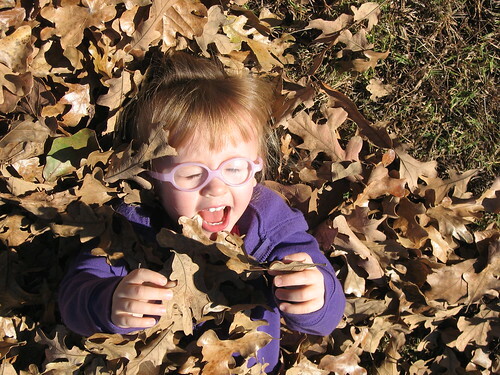 Kaitlyn's favorite thing to do this season is dive into a pile of dry leaves. That's why I love to observe young children. They know how to live in the moment and take joy in the simple things! I make it a point to at least walk in the crunchy leaves every time I go out. People may think it's silly, but it helps keep me connected to that simple, pure joy that kids have. Who doesn't need a bit more joy in their life? And who says joy is just for kids? Yes! Great points! I need to crunch some leaves today. That latest Sofa segment was excellent! Just listened this morning, & can't wait for more Jedi esoterica next month. This makes me so happy! Thank you very much. :) May the Force be with you!